2018-19 State Titles: Day1. December 1st, Lake Bonney YC. Sailing Instructions will be available on the day at the LBYC club house. 2018-19 State Titles: change of date for Day 1. The State Titles for season 2018-19 will be conducted over three days. Each day's sailing and host club is detailed below. Sailing will be conducted during the host clubs' normal sailing programs for the day listed. It is planned each day's sailing will be of three races, giving a potential for a nine race series. Access NoR here. Sailing Instructions will be available on the day at the LBYC club house. To attend all 3 sailing days: $100.00. To attend a single day: $40.00(access the form https://www.theracingcat.com/index.php?page=sa-states-entry-form for nomination and payment details). Note Mark 1 and Mark 2 is the same nomination fee. 2017-18 State Titles report and results. 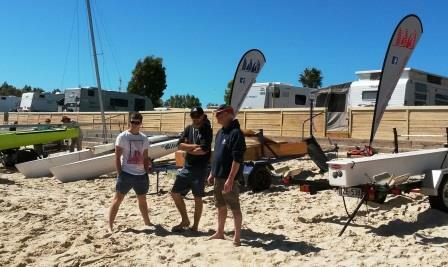 The SA state titles was a small event but there was no lack of companionship and competitive sailing. Saturday day 1: hot, very light wind but a pleasant morning to catch up with the state's mosquito sailors whilst rigging among the 100+ junior regatta and Adelaide Sailing Club boats. After 45 minute delay at sea, eventually 2 of the 3 scheduled races completed in light winds and flat seas whilst 'glued' to the gunwale. Sunday day 2: also warm but wind 15-22+ knots with very lumpy and breaking sea. All 3 races completed using maximum luff tension, traveler down and at full stretch on the trap. A full-on day's racing with some boat damage, and frightening moments for Greg and Kirsten. Monday day 3: a pleasant summer's day, variable wind from the south up to 15 knots but by race 3 was dropping, so off and on the string. That last race for the series had very steep and lumpy waves and sailing to windward required constant attention to boat trim and placement on the waves. Every tack was a challenge, selecting the perfect time to tack within the waves and very easy to 'go into irons' when you got it wrong. Congrats to: Sloop, Warwick Kemp with Kalanhi Bissi, Hubert Tucker with daughter Michelle, Greg Hackett with Peter Dunk and Kirsten Thomas. Cat, Phillip Pearce, Steve Thomas, and Roy Douglas. Special mention of the ever effervescent Peter Nicholson, and the experienced team Peter Hallsworth with son Simon. 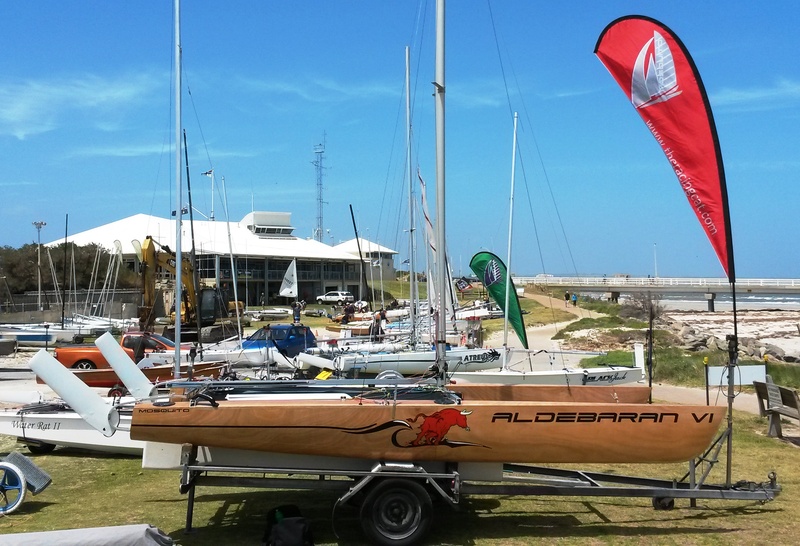 Our titles have been another successful event on many levels, ably supported by Adelaide Sailing Club. For detailed results follow the link above. 2017-18 State Titles, Notice of Race, Entry form and AGM. Adelaide SC: March 10, 11, 12, (March Long weekend). See Notice of Race for details. Please note the Entry Fee is $100 inclusive for the three days of racing. For partial participation nomination fees will be $40/day. There can be up to 3 races sailed each day, details in the NoR. Please submit fees via EFT, see link to nomination form below. Notice of Race (NoR) link here. Sailing Instructions (SI) link here. The AGM will be conducted Saturday evening at the conclusion of Saturday's evening meal, also at ASC, to which you are all invited. The AGM agenda link here. 2016-17 State Titles report and results. The first weekend of the states has been completed with three races being decided on Saturday. These races were conducted back-to-back in 5-15 knots with the occasional bullet near 20kts. With the timing of the event being very early in the season, many competitors (and their boats) were not fully prepared and ready for a full afternoon of competitive sailing. Several incidents occurred ranging from gear failure to collisions and boat damage. 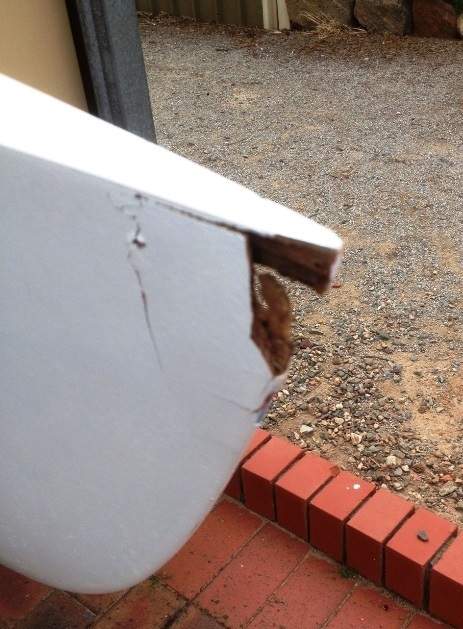 One boat damaged a bow but completed all three races, gradually slowing as the water intake increased. As usual the Pt. Vincent SC conducted a successful weekend on and off the water and the SA fleet again appreciated the club and its volunteers' time and effort during the weekend. It must be noted and special thanks given to Peter Briton-Jones of Goolwa for filling the role of Race Officer for the weekend. Peter and the PVSC race committee planned the afternoon's racing and put in place the procedures to be used during the forthcoming Nationals. With the predicted forecast being correct and winds in excess of 32knots flowing across the bay, the Sunday racing was cancelled. 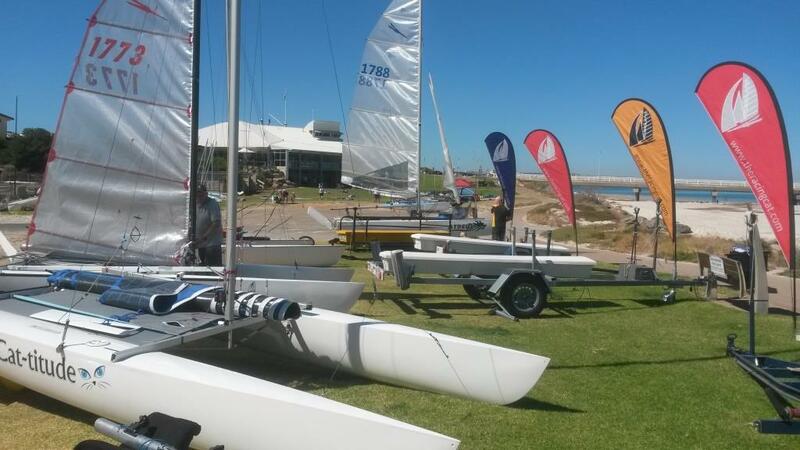 The remaining five races for the series will be conducted at Somerton YC. State Titles, Notice of Race and Entry form. Pt Vincent SC, October 29-30, Somerton YC, February 25-26. See Notice of Race for details. Please note the Entry Fee is $120 inclusive for the two weekends. For partial participation please consult nomination fees listed in the Notice of Race. Please submit fees EFT, details in the NoR. Link: https://www.facebook.com/groups/613228492169456/ We shall be using FB for notifications, advertising events and class invitations. Like our page to join the swarm and get FB notifications. View many historical photographs from club, state and national events. Most can be copied and saved to your own collection. Peter Dunk has been awarded the 2014-15 Sailor of the Year. This is in recognition of his and his crew, Kirsten Thomas success at Club, State and National level during the past season. 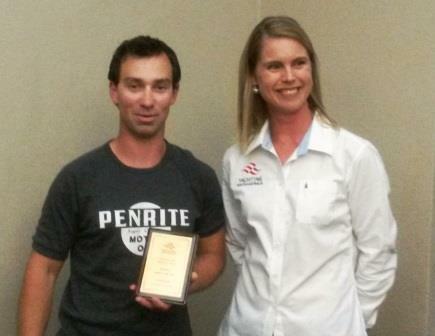 It is also in recognition of Peter's commitment and continued promotion of not only the mosquito class but also club activites at Lake Bonney, Barmera and within the National Mosquito Catamaran Council as national secretary.